Are you one of those people who starts thinking about dinner as soon as they wake up? Spend lord knows how long scrolling through #foodporn posts on Insta? Well the Taste of Dublin festival, taking over the Iveagh Gardens from Thursday to Sunday, is going to be your heaven – we’ve got the scoop and all the tents to mark on your schedule. The menu at Roly’s Bistro Dessert Bar has got us drooling. Indulge your sweet tooth with their mouthwatering lemon meringue pie and fresh raspberry tart, or try a twist on a childhood fave with their Malteser cheesecake. Don’t mind us, we’re just salivating like Homer Simpson rn. Fancy yourself a cocktail connoisseur? Then get your booty down to The World Class Bar and Cocktails where some of the best mixologists in the world will be on hand to share tips and tricks during masterclasses, and dole out samples of high-brow spirits like Tanqueray gin and Roe & Co Irish whiskey. If you’ve been missing Masterchef lately, you’re in luck, because the World Class Bartender of the Year Irish Final will be held here. Gather round to watch the contenders, who’ve made it through months of heats, battle it out in a series of complex challenges for the chance to represent Ireland at the Global Final in Berlin later this year. Finding time to whip up a (healthy) meal as a millennial is anything but easy peasy lemon squeezy. Between college, internships, work, your little cousin’s Communion, and nights out on the town, dinner can often be just a packet of mac and cheese thrown in the microwave or a chipper while watching Love Island. Enter Simon Lamont (AKA The Lazy Chef ) who is at Taste of Dublin to transform your life, or at least your diet. He’ll be teaching visitors how to hack a meal in just 20 minutes, covering everything from flatbread to tacos, and even showing you how to spice up those Pot Noodles you bring for lunch every day with his ‘Ramen Hacks’. Are you a born-and-bred Heinz tomato sauce girl? To be honest, who isn’t? The condiment institution also has an equally amazing mayo on the market and Taste of Dublin is the perfect place to ‘ketchup’ to the program and taste some. Grab free bites from a menu that includes gourmet beef sliders, rustic potato fries, and crispy courgette chips. Plus, catch social media star and STELLAR columnist James Kavanagh there to officially launch Heinz’s (Seriously) Good Mayonnaise. We fell in love with her quirky vintage style on the Great British Bake Off 2016 and now the winner of the series (and Dancing On Ice alum) is in Dublin to share the secrets behind her sweet treats. She’ll be at the festival on Saturday and Sunday and you better form an orderly queue behind us for the first taste of her banoffee pie. Ah Roz. Our favourite food blogger will be at the festival on Thursday afternoon to share some of her best recipes, so why not pop on over to pick up some tips from the social media star? I’m sweat’n after cooking up the pizza & cookies 😅 sorry it took me so long to post this I was busy devouring this & hangry 😭 I was so hungry making it for you guys I was trying not to snack on everything 🤡thanks to everyone who cooked along with me. Any questions ⬇️⬇️⬇️ leave them below 🍕🍕🍕or suggestions for the next demo! I’m thinking a 15 minute dinner??? If you’re a fan of butter and berets, the Connacht Gold Style Afternoon is the place to be. There’ll be sweet treats galore and the most stylish lady or gentleman will win a prize pack including a Playstation, €100 voucher for The Port House Restaurant, a €250 Brown Thomas voucher, and lots of Connacht Gold goodies. Sounds alright to us! What’s a festival without a deadly music lineup? A mixed bag of live acts will be the hitting the stage over the weekend, playing everything from rock and pop to classic and crooner tunes. Now it’s summer! 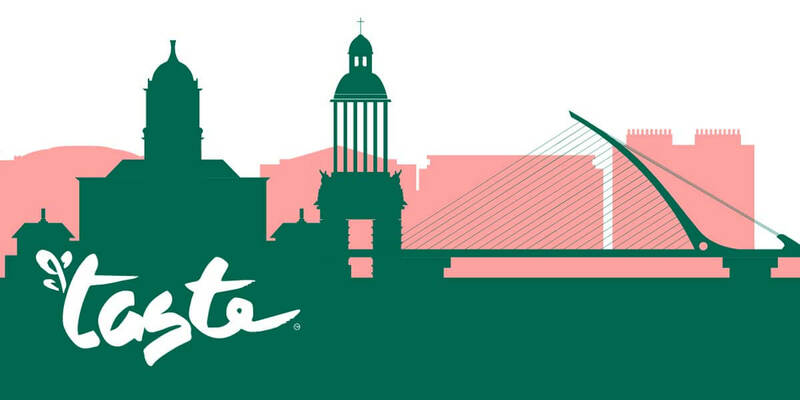 Tickets for Taste of Dublin are divided into lunch and dinner services, much like a restaurant – prices start at €17.50 online, or €18.50 on the door. We’ll see you there!